Time to move into new topic always 🙂 ….a new BI era with OBIEE11g and again with Oracle’s so called emerging OLAP Cube technology.My personal experience using OBIE11g is pretty slow. Couple of the reasons have been already reported under Oracle Support web which will be put together later but just sharing my last report execution time comparing two version OBIEE 10g and OBIEE 11g accessing the same database cube . 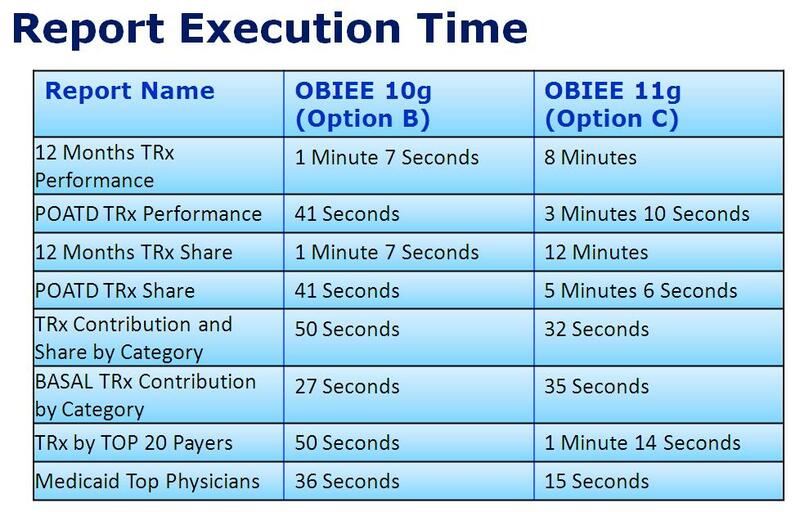 Below snapshot represent the difference of the execution timings for couple of my reports below (while fetching the cube data using OBIEE11g/10g) and it is substantial indeed ! Only thing that is different is that my Database environment hosted into a 32 bit Windows 2003 R2 platform and OBIEE 10g was in that same box but 11g in different box .But that doesn’t and shouldn’t make the huge difference ! Also my overall experience with OBIEE 11g and general opinion derived is that it is pretty slow.